Toyama, often called "the Venice of the East", has many wonderful points of interest that reveal the fascinating history and rich culture of the city. This article introduces seven destinations in Toyama that come highly recommended by the locals. Toyama city is probably best known for being the gateway to the awe-inspiring Tateyama Mountain Range, also known as Japan's Northern Alps, a popular destination for mountain climbing. Seven rivers fed by the clear alpine waters cross the city from south to north, flowing into the Sea of Japan. They stand at the origin of Toyama's renown of being a "water city", often called even "the Venice of the East". Easily accessible from Tokyo, in around 2 hours and 10 minutes by shinkansen, Toyama is an ideal destination for a leisure trip. With its vibrant culture, delicious local food, and beautiful surroundings, this city is one of Japan's well-kept secrets when it comes to sightseeing destinations. Because of it being a port city, with waterway access to the southern regions and even to Kyoto, Toyama has been a strategically important area and several feudal lords fought for it during the so-called Warring States Period (15th-16th century). The city flourished in the Edo Period (1603 - 1868) and was especially known for the good quality of the medicine produced locally. Unfortunately, few traces of Toyama's history can be seen today, as the city was severely damaged during WWII. In fact, 99% of the city was destroyed in the bombings on August 1st, 1945. However, Toyama has risen from the ashes after the war. It is now a modern, majestic city with abundant greenery and many brand new buildings. Thanks to the flourishing local glass industry, Toyama's buildings have wide glass windows or are made entirely out of glass. This results in an overall brightness and transparency which are enhanced by the clear waters of the rivers, making Toyama an indescribably beautiful, light-filled city. 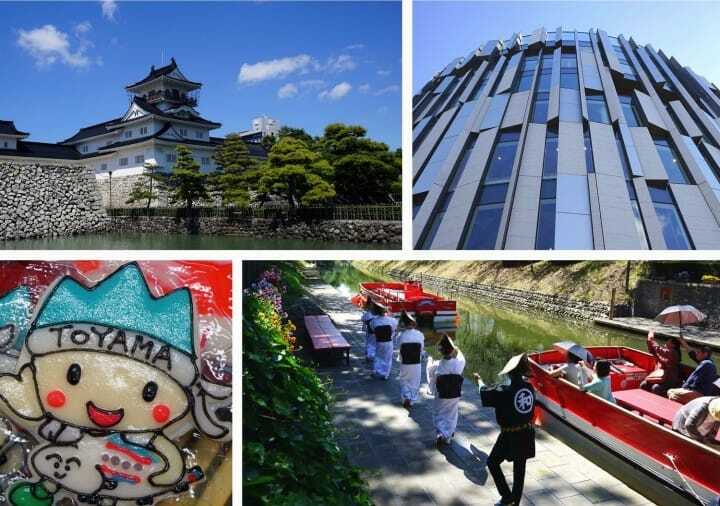 The Glass Art Museum and Toyama Castle are two famous sightseeing destinations in the city. In addition to those, this article will introduce to you great places to visit and leisure activities in Toyama that are known only to the locals. The best way to start your exploration of Toyama is to go on a Matsukawa River Cruise - a leisure boat ride on Matsukawa River, which flows rigt through the heart of the city. Matsukawa is a branch of the larger Jinzu River (*Jinzu means "the path of the gods"), which connects the Northern alps with the Sea of Japan. Both sides of the river are lined with cherry trees, making these river cruises a most sought-after leisure activity in spring. In the summer, the emerald-like color of the surrounding greenery offers just the right amount of freshness for one to overcome the heat. While in the autumn, the passengers get to go through a tunnel of warm, beautiful fall colors against the background of the city. * The river cruises are not held in the winter months from December through mid-March. Check the official schedule for details. During the 30-minute ride on Matsukawa River, the boatman will tell you the story of Toyama - how it flourished during the age of the shoguns (1603 - 1868) and into the modern era, and how it rose from the ashes after WWII. The tale of the city is told with vivid details and humor worthy of an old storyteller. Before you know it, the way you look at the city will change because of the boatman's story and you'll find yourself looking at each bridge and each building as a symbol of Toyama's revival. Each bridge along Matsukawa has its own story and features associated with an episode in the history of the city. Not only historical landmarks, the bridges are extremely visually pleasing too, offering views that can be only enjoyed on a leisurely river cruise. The river cruise boats can also be reserved for private dinner events. If you come in a group and wish to enjoy the best of Toyama cuisine in the special atmosphere of a candle-lit boat cruise, do consider the Matsukawa River Cruises. You will make wonderful memories of the water city! The place where you can purchase tickets and make reservations for the river cruises is Matsukawa Chaya, a tea room by the river in the Toyama Castle Park. At Matsukawa Chaya, you can rest during your explorations of the city, while enjoying a light meal or sweets and drinks. This facility houses the Taki Rentaro Memorial Museum, a collection of objects and documents related to composer Taki Rentaro who spent a part of his youth in Toyama. Taki died very young, at the age of 23, of tuberculosis, but is remembers as an extremely talented pianist and prolific composer. "Kojo no tsuki" ("The Moon in the Heights"), one of the best-known songs composed by Taki, is said to have been inspired by the landscape of Toyama. His story and many others related to Toyama await you on the Matsukawa River Cruises. Please check the information below for details on how you can embark on one of these memorable boat trips. Business Time During the cherry blossom season - Weekdays 9:30 - 17:00, Weekends 9:00 - 17:30. During the other seasons, usually between 10:00 and 17:00. (The schedule varies day by day, so please check the official homepage: http://matsukawa-cruise.jp/en/ ) The boats depart alternately with 15-45 minutes intervals between each departure. Required Time One river cruise: about 30 minutes. Menu/Pamphlets in Other Languages English information available. Access 10-minute walk from JR Toyama Station. Price Adults: 1500 yen, Children (3-12 years): 750 yen, Infants (0-2 years): Free. Ticket discounts available for groups over 15: Adults 1350 yen, Children 680 yen (3-12 years). Next PageNext page: Toyama Castle Park, Toyama Glass Art Museum and more!